In a preview of a speech he will give today outlining his jobs plan, Texas Governor Rick Perry said he will not need Congress to create 1.2 million jobs if he is elected president. "We've put a plan together that doesn't require Congressional action," Perry said on CBS' "The Early Show" Friday. Perry explained that as president he would open up protected federal lands to energy exploration. In an op-ed published Monday in the New Hampshire Union Leader, Perry called for expanding oil exploration on federal lands and off-shore, including the Arctic National Wildlife Refuge and the Gulf of Mexico, and would oppose EPA regulations on natural gas production, including hydraulic fracturing ("fracking"). Of his plan to get 1.2 million Americans working, Perry told "Early Show" anchor Chris Wragge, "We do it by opening up these federal lands and federal waters for exploration. We pull back these onerous regulations that are killing jobs all across this country, and then you rebuild the EPA." "That's what people are concerned about today: They want to know who on that stage, who running for president, really cares about their future and giving them the opportunity to have the dignity to take care of their family with a job, and that's what this plan does," Perry said. "It clearly shows America, in the first 100 days after I'm sworn in, where I can get this country working to bring those resources to the ground, to open up all-of-the-above portfolio of energy, frankly, and make America more secure from an energy standpoint." It's been a rough stretch for him: He stumbled after a series of rocky debates, which he has downplayed ("There may be slicker candidate or smoother debaters, but I know what I believe in," he said). But he's also taken heat for what he believes in, especially immigration. As Texas Governor, Perry signed the first-in-the-nation law giving tuition discounts to illegal immigrants. Then there was the controversy over opponent Mitt Romney's Mormon faith - prompted by remarks from a Texas minister and Perry supporter Robert Jeffress, who said, "In my estimation Mormonism is a cult and it would lend credence to a cult to have a Mormon candidate." All that has caused Perry's support to plunge - from an average of 31 percent last month to 13 percent today. The beneficiary of his misfortunes? Businessman Herman Cain, who has surged past Perry and even edges out frontrunner Romney in some polls. Cain and Perry are fighting to win conservatives who aren't sold on Romney, like talk show host Rush Limbaugh, who backed Romney in 2008, but yesterday said: "He's a fine guy. He's very nice gentleman. He is a gentleman. But he's not a conservative." Working to get his campaign back on track, Perry Friday will give his first policy speech in which he promised "to take the side of workers and employers in America." On "The Early Show," Perry dismissed his recent drop in the rolls: "You're going to have up-and-downs in polls. I was 25 points down the last time I won governor and I think we ended up winning that by a substantial margin, so I don't get confused this early in the race. We have been in this race for eight weeks. It's going to be up, it's going to be down. I doubt very seriously if who is leading in the polls today is going to be our nominee." 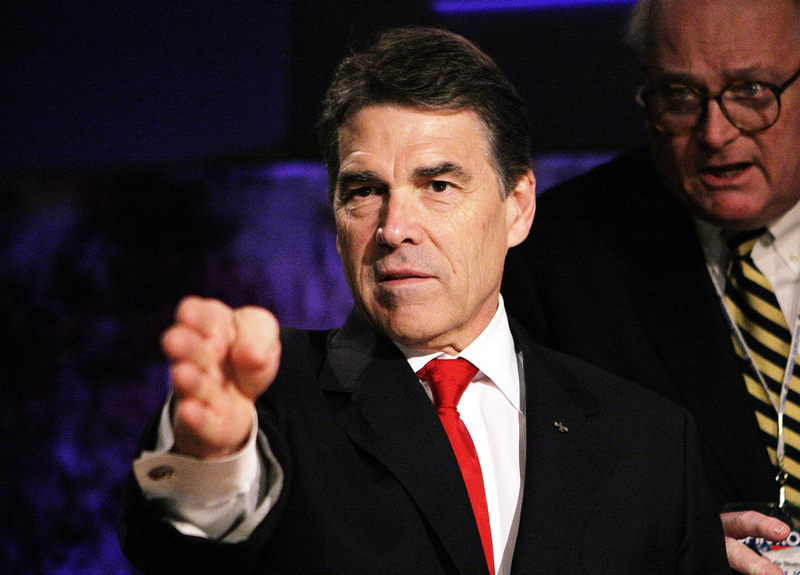 Perry also dismissed criticism of his ties to Pastor Robert Jeffress. "From the get-go, first time we were asked, we said we did not agree with what that pastor said, and that's the fact," Perry said. "Just because someone has endorsed me doesn't mean I endorse what they say or what they do. And that's' the case here and we have said that repeatedly. So I think anyone trying to use this as a political tool just needs to look at the facts. "We clearly said we didn't agree with that statement. But on the other side of it, if I have to spend all of my time disassociating myself with what someone says about me - or for that matter if President Obama has to disassociate people who support him with things they say - we are not going to get much time to talk about how create jobs in this country and that is what Americans are interested in. "They are not interested in these side issues and side shows. They are interested in how you are you going to be able to get me, my family to have an environment where we have the dignity to have a job. I'm laying out that today at Pittsburgh and there are going to be a lot of Americans, Democrats and Republicans and Independents that say you know that's a pet fellow who has a plan for America and I'm going to be for him because he is the one that understands what is going on in this country." Yesterday the governor's wife, Anita Perry, described the past month on the campaign as "brutal." "But we are survivors and we're warriors, and we're climbing back up that hill to try to save America," she said. "Well, families always take these elections probably as tough as anybody. My wife said two things yesterday, she said he's the most conservative candidate in the race and he's a Christian. And I can't argue with either one of those facts.